Succulent grilled shrimp, chicken, bacon and two color bell pepper mix with melted chihuahua cheese. Served with a side of rice or beans. Three tacos with a flash of fried poblano stuffed with steak, bacon, and chihuahua cheese. Serverd with a side of rice or beans. Four home fried tacos topped with our fresh coleslaw. 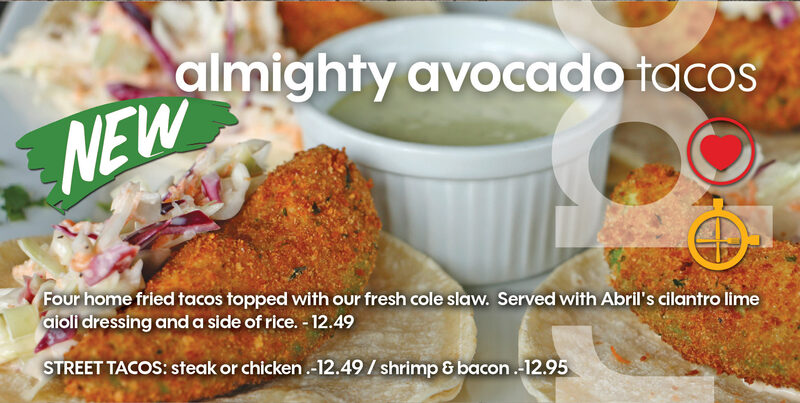 Served with Abril's cilantro lime aioli dressing and a side of rice. Four delicious corn tortillas stuffed with shredded chicken, rolled in our homemade amazing MOLE sauce, sprinkled with queso fresco and red onions. 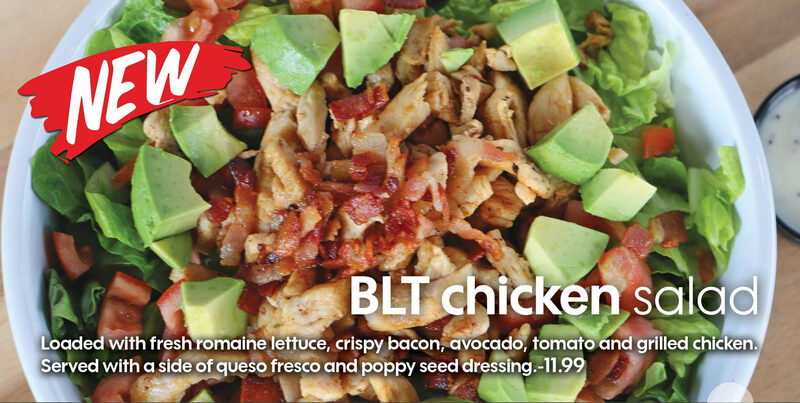 Loaded with fresh romaine lettuce, crispy bacon, avocado, tomato and grilled chicken. Served with a side of queso fresco and poppy seed dressing. 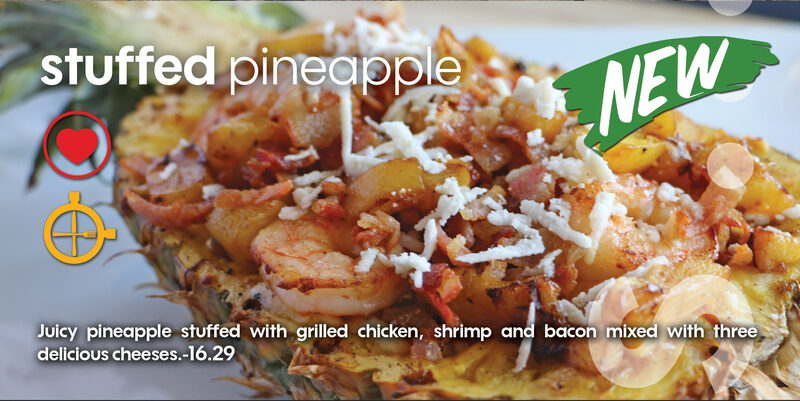 Juicy pineapple stuffed with grilled chicken, shrimp and bacon mixed with three delicous cheeses. 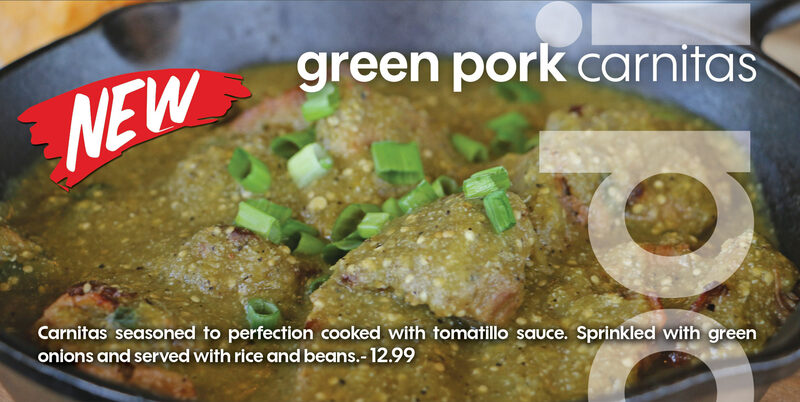 Carnitas seasoned to perfection cooked with tomatillo sauce. Sprinkled with green onions and served with rice and beans. Marinated grilled chicken, juicy ribeye, mix fajita with shrimp and green onions. Served in a seasoned stone molcajete with a side of beans, rice and tortillas. Consuming raw or under cooked meats, poultry, seafood, shellfish or eggs may increase your risk or food-borne illness.